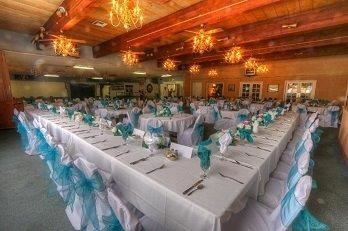 Beautiful scenic location to host your Wedding or other event. Our 12X18' Gazebo is a nice back drop for your big day. Our location can handle from 10 to 300+ guest. We have a 3000 SF event room with a 2500 SF wood dance floor. Full bar, dressing rooms. Fully stocked kitchen with chefs, dishwashers, waitress and bartenders. approximately $3900 Includes table and chairs, large dining room, very large dance floor, Bar with bartender, patio and (Wedding Gazebo for $500 extra), Insurance, basic Security, cleanup, Elk Attendant for the 6 hr. gathering. You are able to decorate a early as 11am of the Sat for your event. You are able to bring your own bottled water, and soft drinks, but must purchase alcohol from our bar as per ABC rules and our license. You can put money down the day of the gathering if you choose to Host a portion of the bar. tax an 15% gratutity will be added to food an drink. We allow you to cater the event with stipulations and we supply the tables for the caterer. Please contact us for complete terms & conditions parties are 6 hours Sat. 4-10 or 5-11pm set up at 11am. music allowed. We have some time week days for memorials or smaller events 11-4:40 or Sun 1:00-7pm I will talk to you first to get details and explain our rules, send a quote to you and then you sign a contract with a deposit to hold the date. You can make payments on event but must be paid in full 3 months prior to event. Currently booking into late 2017.
great place, good value for a large venue with parking and nice interior that can turned into any thing you want with your added touch of decorations. Helpful employees aided us on every aspect of the planning. Professional bookings with contracts that you understand. Book well in advance it is always popular. affordable, and great dance floor. allow outside caterers and event planners.